- Would have liked to have a Second Disting, in order to use one for Noise and another for MIDI-to-CV until I am comfortable with using the Mutant Brain. 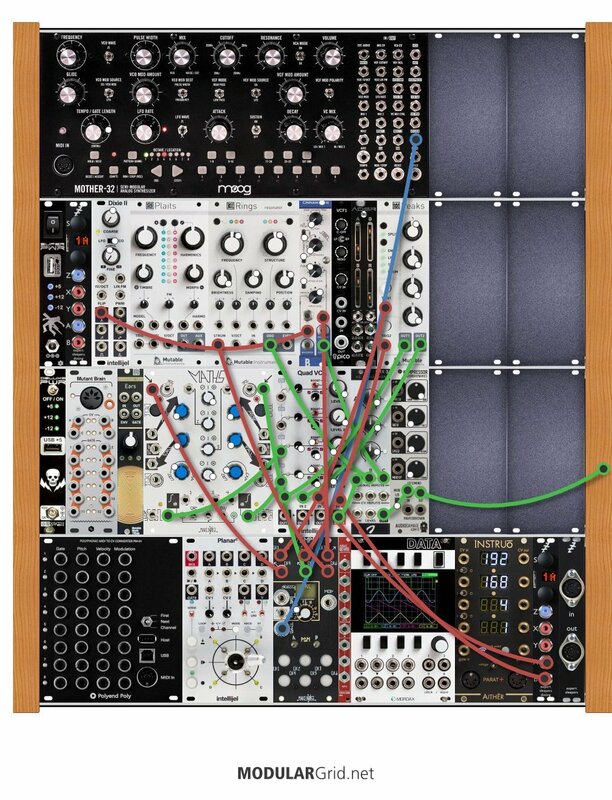 The purpose for this patch was to derive as many Drum sounds as can fit in the available 6 Summed Audio Outputs on the Modular (4 from Quad VCA+2 Additional on Mix 3). More simultaneous drum sounds are possible if Mother 32, Plaits, and an additional Disting are used, but these may not be as modulatable as there are no remaining VCA's (other than simple ones using Maths Channels 2 and 3). Sending simple noise into the Quad VCA with closed Amplifiers, and CVing with Channels 1 and 4 of Maths is particularly effective for expressive changes in "snare" drum length (can then use Peaks as a Hi-Hat). To create a better composition, program and sequence States using Planar 2 as an anchor to bring you back to State 1 ("Chorus" State).